Errrgh! I hate it when I miss something completely simple. For example, I lost the password for the Daring Baker site and couldn’t log in and was completely blind to the little ‘reset password’ thingy. So I missed a challenge, which was cheesecake and similar to the one I made for Easter. Bah! I feel like I need a reset button for my brain. I have been so scattered this month and I can’t tell you how much I’m looking forward to a vacation to the beach. Hay, Hay, Choux Your Stuff! Barbara started Hay Hay It’s Donna Day long before I entered the blogosphere and encountered the addicting world of food blogs and now she has passed this wonderful event on to Bron, whom I am certain will be an excellent caretaker. Many Americans have never heard of Donna Hay and I cringe slightly at the common description of her as the ‘down under version of Martha Stewart’. Although I’ve yet to see a photo of Donna Hay, I have seen her drool-worthy magazines. In all fairness, I haven’t seen any of Martha’s magazines for several years, but the last time I looked it was full of time-consuming projects for beautifying the home, extravagant looking tables, and food that looked like a full time catering company had spent the week preparing. No wonder so many people are made to feel inferior and exhausted just by looking at her projects! By contrast, Donna Hay’s magazine, with the motto of ‘Special Made Simple’, leaves me in a state of utter relaxation when I read it. It’s full of cool blues, greens, and white and the food styling is simple and elegant. 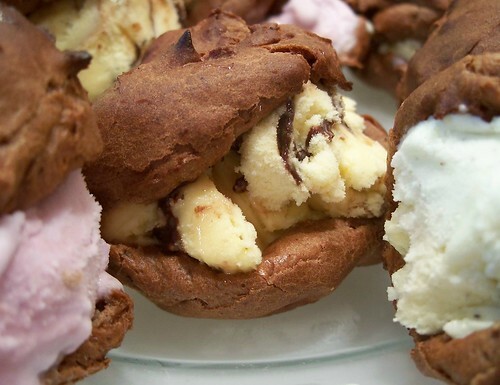 Many of her recipes have a limited number of ingredients yet look absolutely gorgeous. It’s a style I heartily embrace as life is full of busyness and hectic activity and preparing food for family and friends shouldn’t leave you with too little energy to enjoy any of them. So while I haven’t participated in very many HHDD events, I absolutely love the concept and follow them even when I can’t join in the fun. 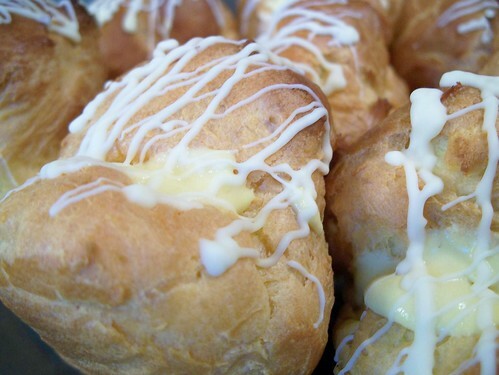 Our hostess this time is Suzana and she picked a choux (cream puff, profiterole, etc) recipe for her theme. 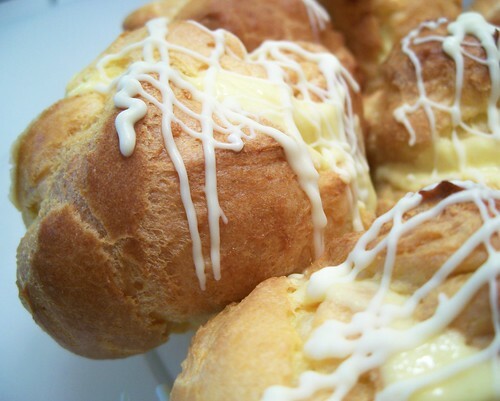 Previously on this blog I have posted savory and sweet choux as well as a casserole version. I made two different versions this time. One is a plain choux that took advantage of leftover white chocolate mango mousse, from the last Daring Baker challenge, for the filling. I squiggled some white chocolate on the tops of these. 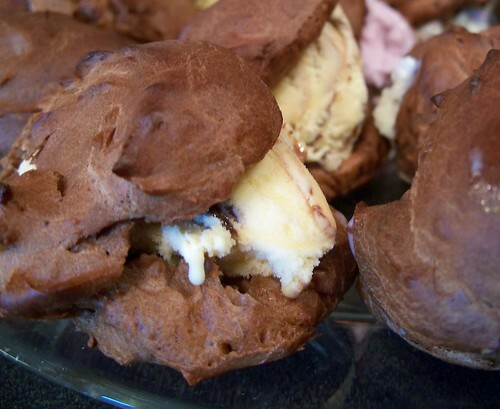 For the other I made chocolate choux and filled it with ice cream and frozen yogurt (three flavors actually: vanilla, raspberry, and chocolate/vanilla swirl). I thought both of these fit well with the ‘special made simple’ concept. 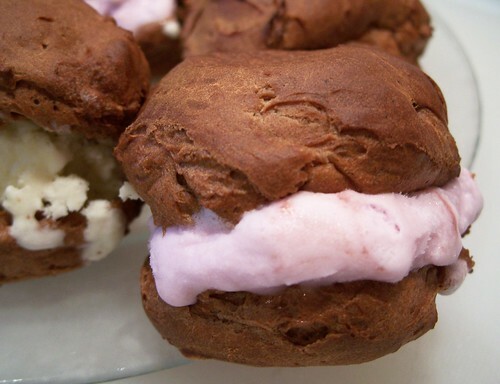 The chocolate version is rather like the ice cream cookie sandwiches that are so simple and fun for summer desserts but the choux pastry dresses it up for something a little more special. Stir together flour, sugar, and cocoa in a small bowl; set aside. In a medium pan, bring the butter and water to a boil. Reduce heat to low and stir in the flour mixture with a wooden spoon, continually stirring until the mixture forms a ball. Remove from heat. With an electric mixer, add the eggs one at a time, beating well after each addition until the mixture is smooth. Drop by spoonfuls or pipe onto an ungreased baking sheet (I line mine with parchment paper) and bake for 25-35 minutes, depending on the size of puff. 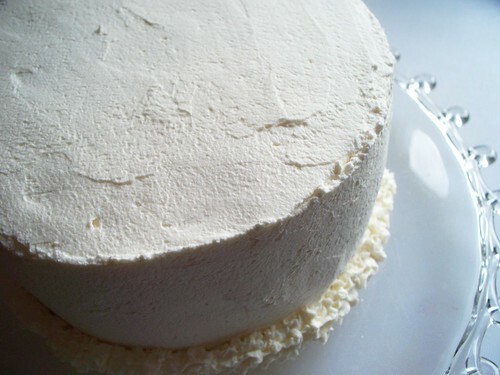 When the puff is finished baking, the outside should be firm and slightly crusty, the puff should move freely on the sheet (if it’s stuck to the sheet, it’s not done baking), and should be slightly darker brown. Remove from oven and cool, away from drafts. Fill as desired.
. . . or something like that. 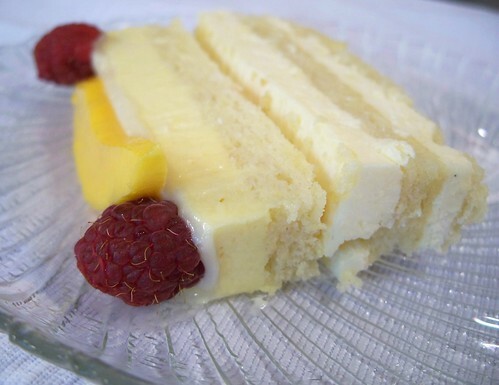 Anyone with internet access and an interest in food blogs knows by now that the Daring Baker Challenge for the month of May, and posted by all the prompt bakers last week, was the Opera Cake in a whiter shade of pale. While opera cake is typically dark with coffee and chocolate, our hostesses and DB administrators extraordinaire, Lis and Ivonne, along with co-hosts Fran of Apples Peaches Pumpkin Pie and Shea of Whiskful, chose lighter colors in honor of Barbara and the LiveSTRONG campaign (she’s also the genius behind Hay, Hay, It’s Donna Day!). 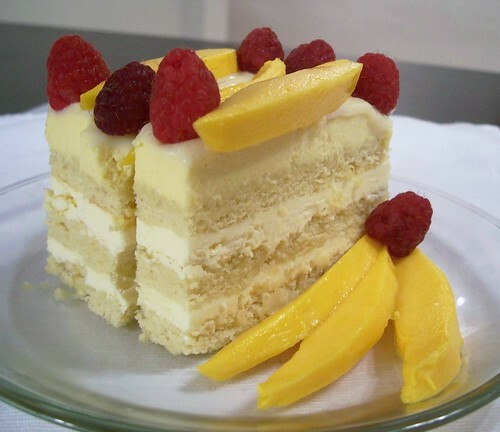 In that vein, I chose mango for the flavor of my mousse and used almond in the cake and again with white chocolate in the buttercream. Part of the reason you could hit the high notes with this cake is the cost of the ingredients. I bought a bag of almond meal for this project and it was nearly $15 and I don’t think there’s enough in it for a second full batch! That makes it even more expensive than my Turtle Cheesecake. Yikes! Of course, for me, it also involved some tragedy. This was a new way of making buttercream and I have to say I wasn’t all that thrilled. When I added the hot sugar syrup to the eggs, I ended up with some long strands of candy coated scrambled eggs in the frosting and it is very delicate (very soft at summer room temp), so if I wanted the creamy smoothness of buttercream with egg, I’d go the meringue route again. For the mousse, I combined elements of the recipe given by our hosts with the mango mousse I made last spring. I melted some white chocolate and stirred it into a mixture of mango, sugar, and gelatine that had been pureed and heated (and then cooled). This mixture I added to the whipped cream. It was still rather soft mousse but held up to the white chocolate glaze because I left it in the fridge for a few hours and the glaze was cool when I spread it over the mousse. The final result is very sweet, strongly flavored with white chocolate, but overall good. Definitely keep it chilled until just before serving it. Would I do it again? Probably not just like this. Actually, I chose to only make half the recipe this way . . . stay tuned for what I did with the other jelly roll pan of joconde! Until then, go visit other Daring Bakers to see what flavor combos they used. Challenge Recipe, without my modifications noted (sorry! ), after the jump. When you think of Illinois, a number of things may come to mind . . . corn, soybeans, flat, flooding, tornadoes, etc. . . . but no matter how optimistic or magnanimous you are, ‘tropical paradise’ just does not come to mind. I’ve never lived in a tropical place. PA, MD, WA (east side, not even the coast), NM, and now IL, none of them could be considered tropical. I have had the opportunity to visit two tropical places while on vacation, however — St. John, USVI and Hawaii. For Christmas 2001, The Husband’s Parents very kindly gave us the gift of watching Thing 1 and Thing 2 so we could get away for a week’s ‘honeymoon’ for our 10th anniversary (Sept 11, 2002, in the days before we had a digital camera, so no pictures). After much debating, we settled on the Caribbean and went to Caneel Bay for eight lovely days. It was actually hurricane season and it was the one year anniversary of the notorious 9/11 terrorist attacks so there weren’t many other people there with us. It was delicious. When I think of St. John, aside from the great time I had making out with The Husband and swimming with sea turtles, the *next* thing that comes to mind is the mangoes. I know I’ve said a million times before and I’ll say it again — I LOVE MANGO. My next tropical experience was Hawaii. The Husband had a microscopy conference in Honolulu — how the man suffers for his work! Once again, I was able to join him, sans Tartlets, for a few days of beach fun. We had a great time walking along the beach, snorkeling in Shark’s Cove, and driving around the island. During the conference we stayed in the Renaissance Ilikai which was featured in a Hawaii Five-O story and a shot of Jack Lord standing on the balcony of the penthouse suite is in the opening credits of the series. After the conference we spent the last two nights in a much cheaper place, Makaha Resort. It was near the end of the road going to the northwest of the island and was a golfing destination (neither of us golf) and the quality wasn’t like Ilikai but neither was the price AND when I got home and realized I had left my dress hanging in the closet and called them, they shipped it home to me without charging me a cent. When I think of Hawaii, I remember the wonderful smell as we drove through the pineapple plantations during the harvest. That and going to a cheesy place for dinner where we met all the people there — the bartender from IL, the girl from PA, the guy who sang karaoke and could perfectly sing every old country and western song they had — and drinking Lava Flows. It was fun. Mix flour, nuts, and sugar. Cut in butter. Add coconut. Press into the bottom of a greased and floured tart pan. Bake at 400 F for 10-15 min or until golden brown. Cool completely. Beat cheese until smooth. Add pineapple, orange juice concentrate, and vanilla and beat until smooth and creamy. Add powdered sugar and custard powder; mix well. Stir in whipped cream. Spread into cool crust. 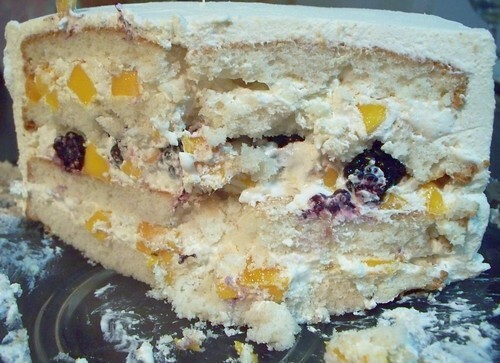 Top with mango, kiwi and blueberries. I’m giving credit to Ilva at Lucillian Delights and David at Cooking Chat for the inspiration for today’s post. The Heart of the Matter theme of seafood and the encouragement to make new creations from leftovers rather than reheat repeats conspired to bring you today’s lunch: fish burritos (not fish tacos with cabbage/cole slaw inside). I don’t often buy seafood in the Midwest as I’ve had several bad experiences, but Ilva had me thinking about seafood I’ve had in FL and St. John so, when I saw red snapper on sale and it looked decent, I picked up a couple of fillets. Of course, it was too much for last night’s dinner and I’m usually not nearly so fond of fish leftovers as I am the first serving. I didn’t put anything on the fish but lemon juice last night for grilling so it left the options wide open for leftovers. I reheated it in a pan with some lemon juice and Old Bay seasoning. Then I made burritos using mostly leftovers from last night — salad of greens, tomato, cucumber and carrots went in the bottom of the tortilla, next the fish, then some leftover tartar sauce, finally some leftover mango pineapple salsa. Oh man. It was good. I have enough fish left to make a couple more and I think that’s what I’ll do — no need to come up with another leftover recipe. I was so excited when Eat Drink Live announced the sorbet theme for the next round of Hay, Hay, It’s Donna Day. I have a Donna Hay magazine that I’ve been keeping on my coffee table because the raspberry semifreddo on the front cover is so gorgeous and now is the season for cold fruity desserts. I had several ideas for this but most were dashed by lack of raspberries and blueberries and then I forgot to buy the ginger or I would have had something very similar to Brilynn’s strawberry mango ginger sorbet! Maybe it was because of Independence Day that I got ‘stripes’ in my head, but I kept picturing a layered sorbet dessert so this is what I came up with: mango nutmeg sorbet resting on strawberry key lime sorbet on top of a pineapple slice. Mix the water and sugar over medium heat until sugar is dissolved. Chill. In a blender, mix mangoes, lemon juice, nutmeg, and sugar water. Puree until smooth. Freeze. 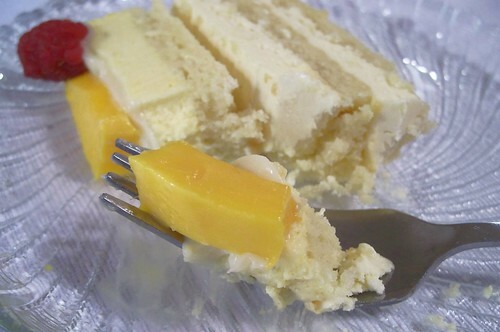 I think I used about 1/4 t. of nutmeg in mine and it overpowers the mango so I’m suggesting less here. In a blender, mix strawberries, lime juice, lime zest, and sugar water. Puree until smooth. Freeze. I don’t have an ice cream freezer. (I’d love to have one and a copy of David Lebovitz’s book The Perfect Scoop) So, I put my sorbets in the freezer in containers and I stirred them a few times before I went to bed and in the morning I mushed them up with a spoon before layering them on the pineapple and refreezing them. As I mentioned above, the nutmeg was a little too overpowering for the mango in the quantity I used — it would be better with either less nutmeg or some peach nectar or something added to give it more fruit flavor. The strawberry key lime is a keeper! We are without children for a couple of days — they get a vacation without parents but with the Grandparents. So we had ‘adult food’ tonight. The kind you make and know no one will turn up their nose and say “Eewwww, what is *this*?” It’s good to have a couple of those days in a year. Since I am without an oven still, I grilled tonight. We had burgers, but not quite like the Husband’s favorites (which involve green chile). I mixed about 1/2 pound of ground beef with some chopped onion, a couple tablespoons of raspberry chipoltle salsa, a sprinkle of bread crumbs, and an egg and made those into patties. When they were nearly done, I topped them with cheese, a slice of deli turkey, a grilled portabella mushroom, and spread the bun with guacamole rather than the typical mayo/mustard/ketchup options. Mmmm. That’s a good burger! I served it with grilled crab stuffed mushrooms that are slightly different than that recipe — no ham, different cheeses, etc, and fruit salad. Later I made some Mango Dreams for us.